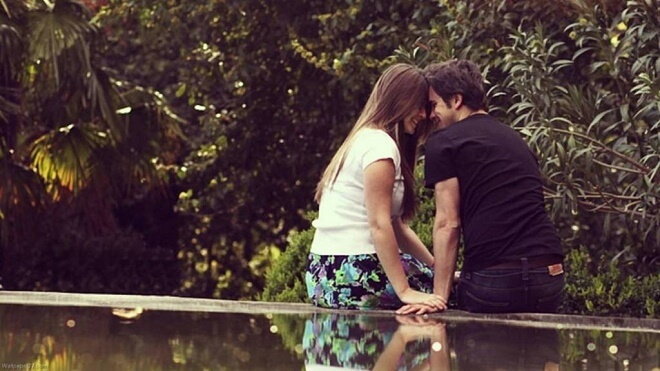 Top 13 Signs He Will Love You No Matter What. If You Notice #9, Keep Him! Finding someone that loves you in spite of your flaws can seem like an almost impossible task. We live in such a judgmental world that often we are our harshest critic and not only do we struggle to love ourselves, but our imperfections can also make it even harder to let someone else love us too. The good news is that those faults you may moan about daily may come in handy when it comes to working out if your boyfriend is a keeper. Accepting both the positive and negative aspects of being someone is essential to a healthy and long relationship. Whether you're a high maintenance girl, way out of his league or not affectionate enough, if he wants to be with you, he will love you anyway. Whenever a guy is going to be there for you no matter what, he'll show it to you in some different ways. If your man exhibits any of these signs, then he could well be a keeper. We've all experienced a bad day in the salon when you come out with hair you didn't want. It can be a complete confidence killer to walk around with a hairstyle you know looks awful and mostly, you just want to hide away. Your boyfriend's opinion can have a lot to do with your reaction, as after all, you want him to fancy you. If he tells you, you look as beautiful as ever and means it; it can make all the difference. Seeing that love in his eye, even with a disgusting hair disaster, will be a huge source of comfort and relief. If he admits he fancies you less because of it or urges you to get it changed immediately, because he would be embarrassed to be seen with you, then it could be the end. Our appearance will go through many changes over the years, and at the end of the day, it's our personalities that form that enduring bond. If your relationship can handle a bad hair day, it's probably not worth it. We might try to hide imperfections under makeup, but these are what make our faces unique and are often the features our man will love most about us. If he's a keeper, it won't matter whether you're wearing makeup because to him you're beautiful whatever. They may even prefer you without. When we don't have makeup on, we are often at our most vulnerable, pure and untouched and it can be in these moments that we appear most attractive and natural to our other half. If a guys a keeper he's going to be with you through all ages, so it won't matter to him if you begin getting a few extra lines as you get older. If you're worried about how your appearances are changing, but your man just reminds you how much they love you and the way you look then you should probably listen to him. He's showing you devotion, respect and trying to comfort you about your insecurities, that to him isn't important. Wrinkles are just reminders that you've been together a while or marks that show the life you've had together. If he's not bothered at all that you are getting older, then he's a keeper. Women spend so much of their life worrying about their weight and appearance but ask a man who is really in love, and it won't matter to him at all. So we might feel like we've put on a few extra pounds, he might have noticed, but if he loves you, chances are it hasn't put him off you or changed his feelings. If he says he loves you one minute but then discovers you've gained a few extra pounds and is put off, did he really love you at all? Much of the time, weight only becomes an issue when it makes you feel insecure or unattractive. If you're not feeling your best, you can become depressed and even withdraw from your partner, even if they still fancy the pants off you. If a guy is going to be in it for the long haul, he won't care about weight gain or weight loss; it’s your soul he loves not your dress size. When you build a life with someone, usually you split the burdens and responsibilities down the middle, but what if you're struggling and need a bit of extra support? In a relationship, the testing times are the ones who tell you whether you have a future together. If you're jobless, homeless, lacking in confidence and he stays with you through it, then you know he's a partner for life. Being understanding of anyone, especially someone you're in a relationship with can be hard work. It's important to appreciate how much he must care to stick around. Even when others have abandoned you. No-one can be happy and confident all the time, and once in a while, everyone has a bad day. You might even take your mood out of him and be less than pleasant to be around, but he won't take it to heart and understands it's just one of those days. And if he's on hand to cheer you up with a home cooked meal, a massage or even just willing to listen to you rant about your problems; then it's a sign his love is unconditional. Sometimes people mistake controlling for caring but make no mistake these two are very different. Finding someone who doesn't try to control you whether it's your appearance or lifestyle can be tricky so if you find someone, hang onto him. Many women feel stifled in a relationship because of their partner's need to have control over where they go, who you socialize with and even their hair and makeup. If a partner leaves these decisions up to you and values your freedom, then you know he's emotionally mature and balanced enough to be in a healthy relationship. They are considerate of the fact you are your own person and need the freedom to live and explore life as much as they do. Not placing restrictions on what you do and instead supporting you to experience as much as possible is the ideal kind of partner. A boyfriend who is always there for you is important, but one that appreciates that sometimes you need space to be yourself is irreplaceable. Life isn't always easy, and even the most friendly people can need a time out now and again for some self-discovery. If he's really for you, he will understand this and give you uninterrupted space for you to enjoy and relax in solitude. He won't resent it either or attempt to make you feel guilty for needing time away instead he will love and support you through it and know that you'll come back to him when you're ready. If he loves you unconditionally, why would he need to change you at all? Everyone has their flaws, but if they are accepting of that, then there should be no reason to become a new person, so your partner will love you. Everyone has their quirks, whether it's odd habits, strange hobbies or questionable dress sense, but these are part of you and if he loves you, he'll accept them. Your partner should be in love with you after all, not some version of yourself they would like you to become. It doesn't matter how much you love someone; they will inevitably at some point get on your nerves. It could be an ongoing irritating habit or just an afternoon, but chances are you will be irritated by your partner at some point. The good thing is that, if he's a real keeper, he won't let your moodiness put him off. Seeing you in all your different colors will only help him get to know you better, and if you're going to be together for a long time, he's going to have to get used to dealing with all sides of you. You're only human after all, and if he runs at the first sign of a black cloud, then he was never going to be able to stick out a lifetime of ups and downs. No-one is perfect and if your man can accept this and accept you're going to get it wrong now and again then don't let go of him. Part of successful relationships has the ability not only to forgive but forget as well and even help your partner understand mistakes are part of normal life. At times we can be too hard on ourselves if things go wrong and a partner can sometimes be the only one that can help us forgive our faults. If he's able to do this, then it shows he has a deep commitment and understanding of you and might just be your ideal guy. If a man is willing to give you a second, third or fourth chance, then it's a sign he not only loves you but believes you are worth another shot. If he didn't, he would have left after the first time. Don't mistake giving you another chance with weakness; it takes a strong person to let someone make amends and isn't something you should take for granted. If he's willing to wait around for you to prove your worth, then you know he's fully committed to making it work. Everyone pulls baggage from their previous relationships into their new one, but the key is how you handle it. If he's willing to listen, understand and help you work through those issues, then you have someone who not only loves you but sincerely cares about you as well. It can be hard not to recover from scars of the past, and you're more likely to do it with him by your side helping you than alone.